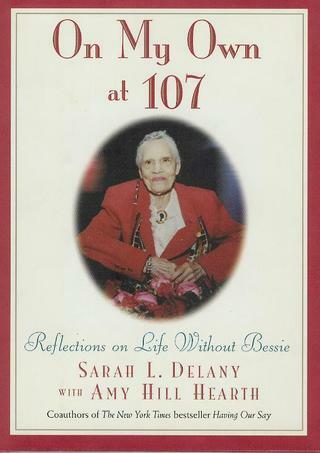 Written following the death of Bessie Delany at age 104, On My Own is a tribute to Bessie by Sadie Delany and Amy Hill Hearth. Illustrated by Brian M. Kotzky with watercolors of flowers from Bessie’s garden. A tenderly-written guide to recovering from the death of a cherished loved one. A national bestseller. The Delany Sisters were devoted to each other, but inevitably, their remarkable, century-long relationship came to a close with the death of one of the sisters. Perhaps surprisingly, it was the younger sister, Bessie, who died first. In the year preceding her death in 1995, Bessie had become increasingly frail. Those of us who loved her could see that she was fading away before our eyes. She died as she had wanted: at home, in her bed, with Sadie nearby. "True to form, Bessie managed to 'have her say' at her own funeral! A few months before her death, she took my hand and said, 'Amy, when the time comes, tell 'em the old gal was quite happy.' She made it clear that she wanted me to speak those words to comfort her mourners at her funeral. Three days after her death, at the Cathedral of Saint John the Divine in New York City, I stood up and repeated her words. As my words echoed in the huge caethdral, I looked past the throng of mourners, the celebrities in the front row, and the television cameras and newspaper photographers recording the event. I saw only Sadie, dressed in a brown suit with a matching beret, crumpling and uncrumpling a handkerchief in some unconscious ritual of grief. "At first the loss of Bessie seemed unbearable. At the time, Sadie Delany had just turned 106 and was on her own for the first time in her life. Always known as one-half of a pair, her identity forged since birth as one of the Delany Sisters, Sadie suddenly found herself, unwillingly, an individual. "One of her first reactions, however, revealed her resilience. When an interviewer asked her what she would do now, after the death of her sister, she said, 'Another book! Then she turned to me and said, 'If that's okay with you, Amy.' I laughed and said, "Of course," delighted at this powerful indication that Sadie had hope for the future. "Sadie Delany has given us an invaluable gift: she shows us that even at the age of 107 it is possible to begin again."